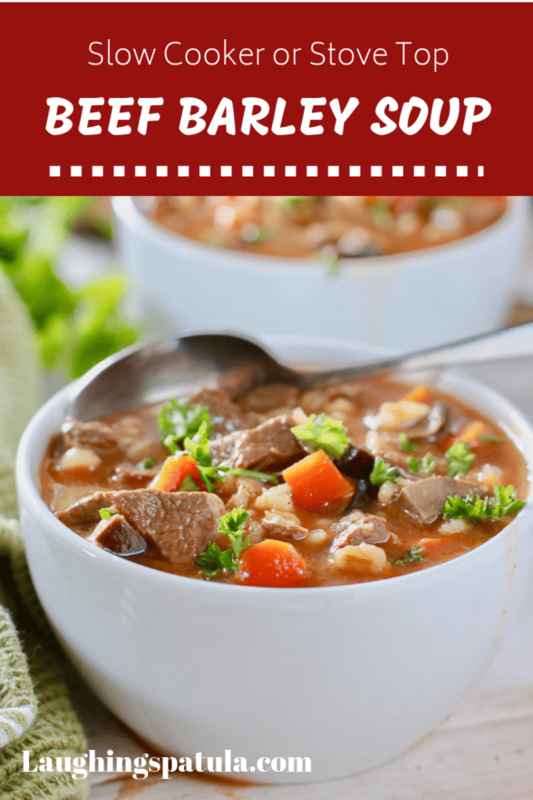 Beef Barley Soup in the slow cooker or on the stovetop, you are going to love this hearty soup! Perfect for anytime of the year- but during the winter this is an especially great, hearty treat. I don’t use my slow cooker enough. I find that most of the dishes come out a bit opaque and over cooked. Thats why I love this recipe. The beef actually needs all that slow cooking time to become tender and delicious! And look how vibrant the colors are, even after a long time in a hot tub! 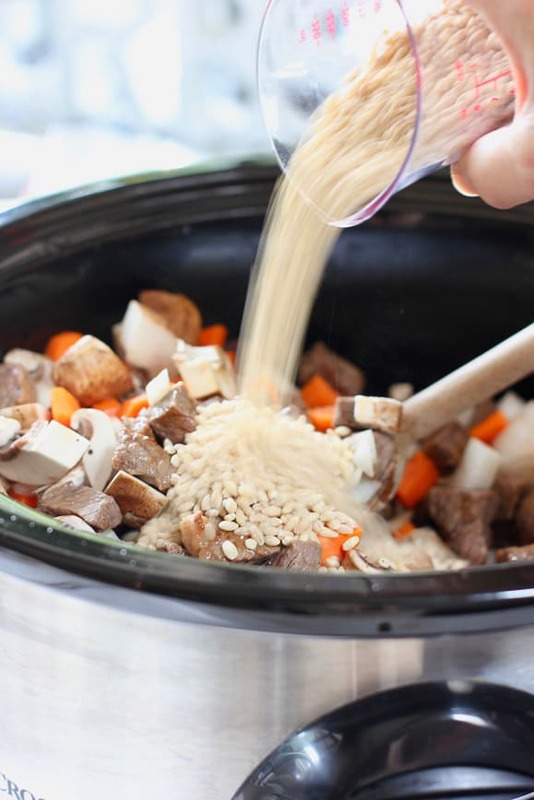 How to make Slow Cooker Beef Barley Soup! I started with stew meat that I cut into small 1/2 inch pieces. This is soup, not stew so I wanted the pieces small. We deepened the flavor by browning it in a skillet before tossing the meat in the slow cooker. Browning is not required, you could add the meat to the pot uncooked, and get a good soup, but we like the depth of flavor it adds. Up to you and how much time you have! I should also mention that you can make this Beef Barley Soup on the stove top. Simply follow the recipe without adding it to the slow cooker. Simmer for 2 hours or until the meat is tender. Chop your veggies and toss into the pot with the stew meat. Again we kept the pieces on the small side so it felt like a soup. At this point you just dump everything else in! 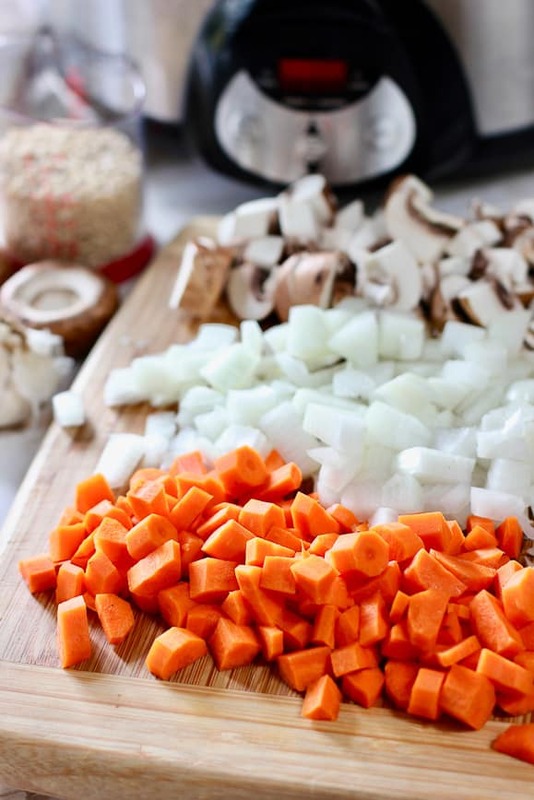 Veggies, barley, broth and seasoning…boom! 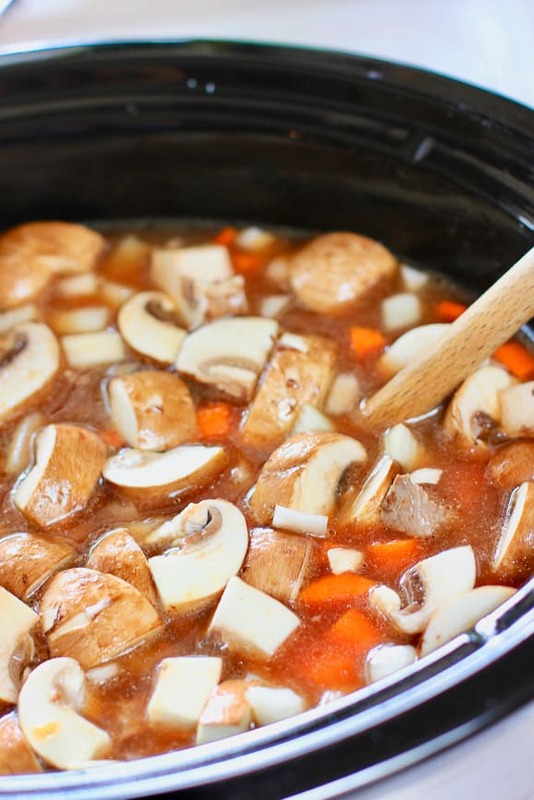 Floating mushrooms in the pot with beef, broth and veggies! Now just turn on your slow cooker and let it do all the work for you! Need a soup fix in a hurry? Check out our 20 Minute White Chicken Chili or this savory and delicious Chorizo and White Bean Soup! You can see all of our FAST FRESH AND DELICIOUS soups HERE! 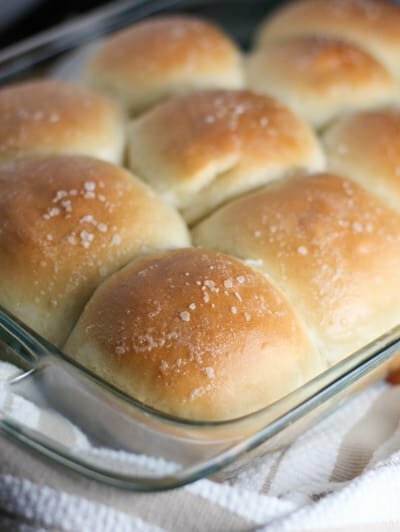 And while the slow cooker is slow cooking…you could whip up a batch of our one rise, easiest rolls ever! Grab the butta! You mix the dough and shape. Let rise in the oven at 170 degrees and without even removing these beauties from the oven, crank up the heat and finish cooking. Doesn’t get much easier than that! You might also like this Slow Cooker Beef Bourguignon. Sounds fancy, but it’s just beef stew with red wine. 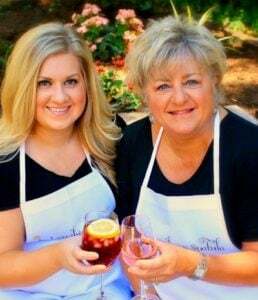 A little for the pot…a little for the cook…hiccup! 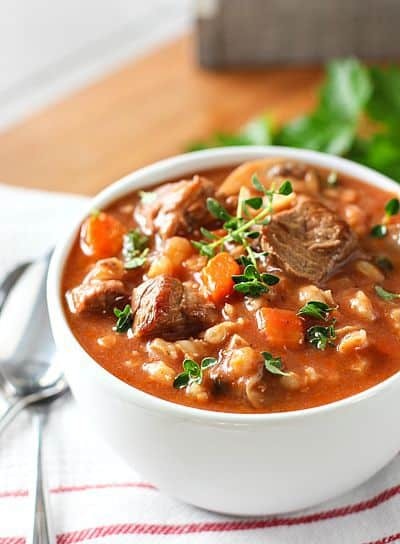 This hearty beef and barley soup can be made stove top or slow cooker! It has a rich meaty flavor and takes only a few minutes to get into the pot! In large skillet over medium heat, heat the olive oil until shimmery but not smoking. About a minute. Sprinkle beef pieces with salt and pepper. Add to hot skillet leaving undisturbed for 2-3 minutes until a brown crust forms. Turn beef over and sear the other side. (you may have to do this in two batches depending on the size of your pan). Add seared beef to slow cooker. (or large dutch oven or soup pot if cooking stove top). Chop carrots, onions, mushrooms and garlic. Add to pot with beef. Cook in slow cooker for 4-5 hours on low or 2-3 hours on high. 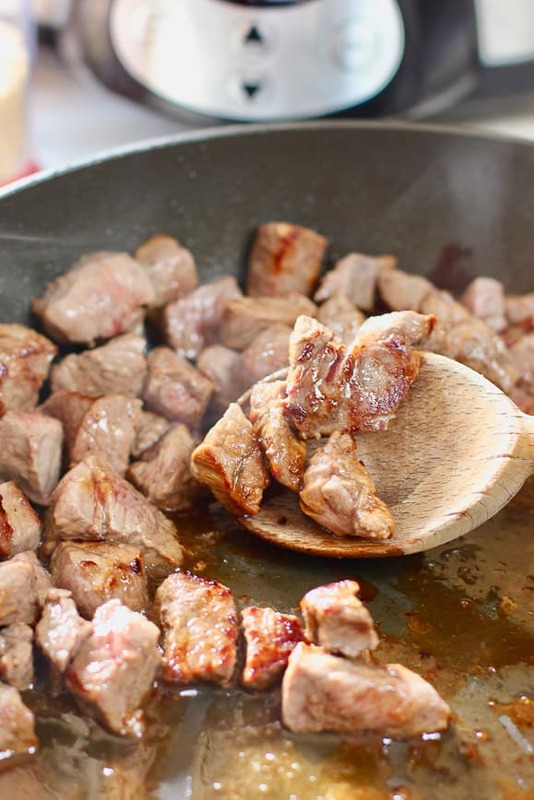 If using stove top method, simmer 2-3 hours, or until beef is tender and veggies are cooked. 4 Weight Watcher Freestyle Points per serving (about 1 1/2 cups). 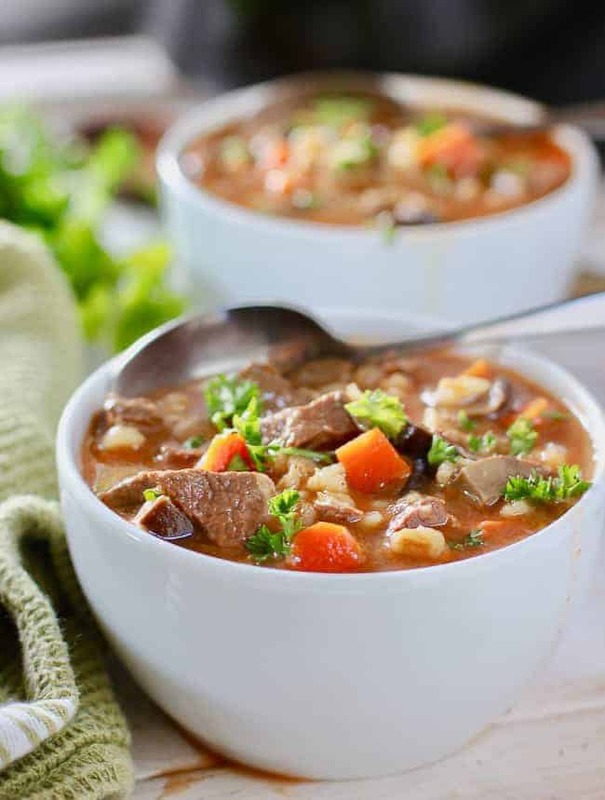 You can make this Beef Barley Soup on the stove top. Simply follow the recipe without adding it to the slow cooker. Simmer for 2 hours or until the meat is tender. Chop your veggies and toss into the pot with the stew meat. We kept the pieces on the small side so it felt like a soup. Browning is not required, you could add the meat to the pot uncooked, and get a good soup, but we like the depth of flavor it adds. Up to you and how much time you have! Does the carrots go to mush if cooked that long? I noticed you suggested putting potatoes in to someone for the last couple hours, wouldn’t that be the same for the carrots? Hi Nicole – nope, they don’t get mushy. Potatoes do but the carrots stay pretty firm. Good question though! can i leave out the tomato paste? It deepens the flavor of the beef stock and thickens it up and bit but yes. You can leave it out without too much damage! I was going to try this today I was wanting to put potato in. What theme would be the best time to put them in? Hi Monique – I would think the last couple hours should do it. Thanks! I’m trying this soup now! And boy o boy does it smell delicious! Can’t wait to try it! Thank you for sharing your recipe! Hi, I plan on making this and accidentally bought quick barley instead of pearl barley. Would I be able to use this like the recipe states or would I need to wait and add it at the end. I’ve never cooked with any kind of barley, so advice would be appreciated. Thanks! Hi April – I have never used quick cooking Barley but I can’t see any reason you can’t use it. Like you suggested, just add it in later. Hope that helps…. This looks wonderful!! Just checking on the timing…did you mean 4 hours on high or 6 hours on low? Thanks. Sorry for the confusion! 4 hours on high or 6 hours on low. I’ll fix the recipe…thanks for catching my goof! Hi Kathi! 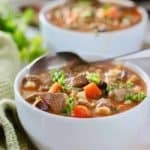 Tihs soup looks great and I am planning on trying it this week. Question about the cooking time. You have listed here 4 hours on low and 6 hours on high. You noted that on low yours cooks fast, so I believe you meant the 4 hours on low part – but on high, should it be halved? 2 hours on high? I can’t iagine 6 hours on high if it can complete in 4 hours on low. Just wanted to double check before I scorch it! Thanks! Oops, my bad! 4 hours on high or 6 hours on low…thanks for catching my goof! Like you I use chuck but I buy a large piece and cut my own. Even better, since I end of up cutting the stew meat into smaller pieces most of the time! Thanks for your note Sammie!